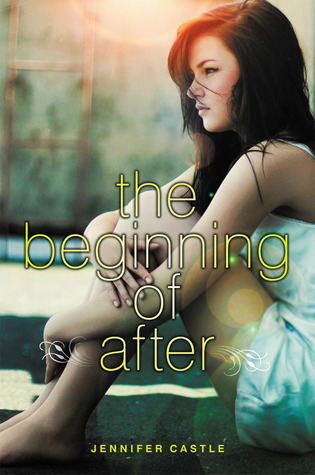 As soon as I saw that The Beginning of After by Jennifer Castle was available on NetGalley, I requested it. As soon as I got the go-ahead, I downloaded it and read it in one sitting. It was incredible! A very character-driven, emotional and wonderfully written story. A lot of books that deal with loss are hard to connect to. The author has to be a very gifted writer in order to make emotions feel genuine. Well y’all, I don’t think I’ve ever seen it done better than Jennifer does with this story. Laurel’s path, from the initial shock on through, was incredible. I can’t even try to count how many times I teared up while reading. All the feelings: anger, betrayal, guilt, grief, are so believable, I felt like I was reading a friend’s diary. One of the best things was Jennifer’s ability to portray Laurel’s thought process. You guys know how, when you walk into a room, your eyes pick up on something random (like a knick-knack, piece of furniture, whatever it may be) and it makes you think of some story from your past that isn’t even necessarily directly related to whatever you’re looking at? (Say you look at a random shoe and it reminds you of the time you played basketball with your brother over ten years ago.) This happens to Laurel fairly often – she’ll see something that reminds her of a specific memory of her family. Every single time it happened I felt like crying. Incredibly realistic and poignant. David and Laurel’s interactions are also very realistic. Awkward and angry at first…it morphs into a tentative friendship since no one else can relate to them like they can to each other. As they become closer, their chemistry becomes harder to ignore. I know I’m being repetitive here – but I really can’t emphasize enough that the characterization in this book is incredible. David and Laurel’s personalities are both explored at length and they are both far from perfect. They make a lot of mistakes with each other that make their story seem even more genuine. I know there are a lot of contemporary young adult books that deal with grief and loss, but I can promise you that this book feels nothing like a tired plot line. This is easily as good as – or better than – others like it. Even if you don’t normally enjoy melancholy/tragic reads, I still highly recommend giving this a try. If you are a fan of books like this, prepare to have a new favorite! With only one book, Jennifer Castle has made my must-read-author list. AMAZING review Allison! My goodness! I thought I was already excited for this one, but now… Yikes! I'm like itching! 😛 Contemporary is my genre and I cannot wait to read this one! You know, if you liked this one, you might like Willow by Julia Hoban, too. It's got a similar premise, but without the complication of the boy being tied to the tragedy. It also deals with cutting, which was tough to read but illuminating. thanks for the rec! I've heard of Willow, but now I'll definitely check it out. i am seeing this one EVERY where!! Thanks for the review! Oy. Sounds like a tearjerker, but also a great read. Thanks for the review. I'll to look into this one soon. Yay I'm so glad to see you enjoyed this one, as it's definitely one of my favorites of '11. And I agree- the characterization in this is fantastic!